We posted about Penelope a few weeks ago. Her post was overshadowed by another dog that had been at the shelter. She had very few shares. We felt so sad for her! She is a very sweet girl in a terrible situation. 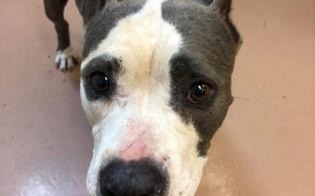 Due to her medical condition, she is at the top of the euthanasia list. Her age is estimated at 5 years old. She has a HUGE mass on her neck and she is HW positive. Fortunately for Penelope, one special person did see her post and she has expressed interest in helping her....but she can only help so much. I told her that I would do what I can to help her! We sent Penelope to the vet to be examined. We had the vet give us an estimate for all of the medical help that she would need. Mass removal, HW treatment, thyroid test, tags removed, dental and spay. The estimate was close to $700. In order for us to help Penelope, we need pledges. If we can reach the goal, we can get Penelope off of the euthanasia list and to the vet. Then we would need to find the perfect forever home for her. Please, any amount would help us get to our goal. We are asking for pledges, instead of donations. Once we raise enough pledges, we will post a link for you to honor your pledge. If we are able to get enough money pledged (promised) we can take Penelope off of the EU list and get her to the vet. Please, go the the Last Chance page to pledge. Please, help Penelope. If you can't pledge, please, share! Bless you all for what you do for these little sweethearts. No animal should be a throw-away. Penelope, enjoy your new life! So happy for you, sweet Penelope!